The 1888 N43 Allen & Ginter World's Champions Set contains 50 cards measuring 2 7/8" x 3 1/4". The N43 set is composed of exactly the same cards as the N29 Allen & Ginter set. The fronts appear as if they contain a N29 card with various scenes in the background. The set has been considered to be one of the most beautiful issues of the 19th century. 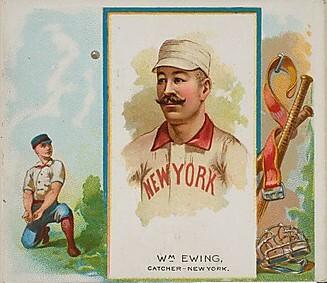 Hall-of-Famer Buck Ewing is the only notable player included in this issue. Other baseball players in this issue include Joseph Fogarty, Jimmy Ryan, Charlie Getzien, George Miller, and John Morrill. CLICK HERE if you want to sell your 1888 N43 Allen & Ginter World's Champions Cards.